Marking the 15th anniversary of the Naruto manga and part of "Naruto's New Era Opening Project", the latest issue of Shonen Jump Magazine has revealed that a new Naruto movie will premier this December 6, 2014 titled: The Last -Naruto the Movie-. 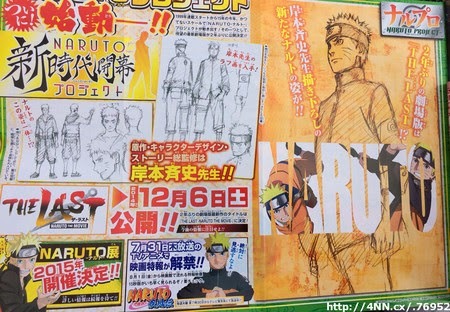 The scan above shows the initial sketches of an older and mature Naruto Uzumaki with shorter hair. Naruto creator Masashi Kishimoto will supervise the story of the film and its character designs. Fans need to watch out for the 15-sec trailer that will air during the Naruto Shippūden TV anime's broadcast this July 31. A full version of the trailer will run in Japanese theaters starting August 1st. Finally, the article notes thata Naruto exhibition will open in Japan in 2015.